Pictures, video tapes, Super-8… Many images we keep at home are as important as the knowledge, experiences and our own memory that we keep inside our heads. Digitalization is a simple resource that helps us to rescue from oblivion our memories from our life in L’Horta. 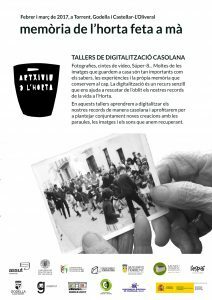 In this workshops we will homemade digitalize our memories and will seize to discover in common new word, image or sound creations as soon as we regain them. Workshops are taking place during February and March 2017 at Torrent (February 9th and 16th), Godella (March 2nd and 9th) and Castellar-L’Oliveral (March 23st and 30th). Please register through this application.